Anyway, there's always the adage that has come down through the generations: "We came, we fought, we won, let's eat." Works for almost all of the Jewish holidays. I'm all for the "let's eat" part. Since I teach regularly about genocide in history, it's hard for me not to think seriously about the more violent aspects of (almost all nations' and religions') cultural traditions. ...And R. Yochanan further said, What is the meaning of the verse, And one came not near the other all the night? [Exod 14:20, of Pharoah and the Israelites separated the night before.] The ministering angels wanted to chant their hymns, but the Holy One, blessed be He, said, The work of my hands is being drowned in the sea, and shall you chant hymns? Which I take to mean that once one dives a little deeper into the tradition, the ambivalence about celebration is already there. Also, I think it's quite possible that in fact, the massive death of children in more is more literally true of contemporary wars than of ancient wars; pace quite a few triumphalists about modernity, there's not much evidence that the ancient Israelites ever did anything like, say, bombing a pharmaceutical factory in Sudan. I guess what I mean to say here is I'd be careful before thinking that celebrating the imaginary deaths of children and actually killing them are directly correlated, or causally related. In fact, the relationship between religious celebration and military practice may be better explained in terms of imaginative, symbolic expression or "catharsis" (used in the modern, non-Aristotelian sense) than in terms of "values" or actionable moral claims about the world. It'd be over-simple and probably false to say that ancients talked about killing their enemies' children and we really do it, but I'm not sure it's any more false than any number of more intuitive, superficially plausible narrative about moral progress. That's an interesting take Eric. Is your idea that since it is not literally true, we are at least free to retell the story in a way that is more in accord with our current values? Because if it's not that, isn't it actually more disturbing that we continue to celebrate an untrue story with those characteristics? If it were true, then at least we just wouldn't have much choice in the matter. I still think your main point holds. The hebrew god, being omnipotent, did not have to inflict ANY harm on anyone, especially not all those innocent Egyptians outside of the royal court; in fact the myth tells us that god "hardened Pharaoh's heart", meaning he encouraged Pharaoh to refuse letting the Hebrews go, despite the plagues, in order to eventually bring maximum destruction upon the Egyptians. Like you, I still feel these parts of the passover tradition consist in celebrating revenge and suffering. Although I am by no means religious I love the holiday tradition and all the rituals associated with it -- and I normally do not have the reform attitude of reinventing those traditions to fit contemporary morals. I enjoy the ritual, let us say, purely for its aesthetic value. In this case, however, given that one of the functions of the ritual is to educate the young ones, I just could not take the aesthetic point of view. We chose to spend part of our Seder telling the children about Harriet Tubmann and the struggle against modern slavery. There was no vengeful god in that story. Anon Apr 27 08:11: Yes, the diversity of perspectives and the encouragement of questions is one of the wonderful things about the holiday, including the capacity to appreciate the "evil" son who rejects or challenges the tradition. summortus/Raffi: Sorry about the delay in posting. After some serious problems last year, I had to change my comments policy to requiring pre-approval. I agree that there is already some ambivalence about the death of children in the tradition. The tradition is so manifold and multi-voiced! I think there must be a strain of that from the very start. On genocide: Although I disagree with the moral triumphalism of some stories of moral historical progress, such as Steven Pinker's, I do think it's pretty clear from the historical record that there has been a trend in the West, over the centuries and millennia, toward at least more *outward* show of concern for the civilian members of outgroups. Reading the book of Joshua, for example, it's hard for me not to stand amazed at what seems like a frank celebration of genocide. Although the stories there are not historically accurate, or are perhaps a very distorted view of history, the fact remains that the people who wrote it and passed it down through the generations -- like the people who wrote the traditional Passover Haggadah -- seemed mostly untroubled by the narrative. It is true that we still stand by inactively in the face of massive genocide (Rwanda 1994) and engage in military policies that klll civilians (drone attacks), but I do think it matters that there is at least an *outward* show of condemnation and regret. I don't think that outward show is entirely phony. So I do think there has been progress -- similar to the progress of what Pinker calls the "rights revolutions": women's rights, worker's rights, gay rights, ethnic rights, children's rights, rights for disabled people, etc. How permanent the progress is and how deep it runs remains to be seen. Contra Pinker, I'm not impressed that it has been 70 years since World War II and the Holocaust. Seventy years seems not as long to me as it seems to him, I guess. Randy: I don't think we are entirely free to retell the story. We are constrained by the traditions of the holiday. To rewrite it entirely to accord with our current values would be like leavened bread on the Seder plate. 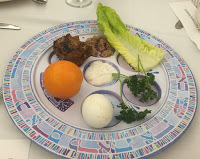 We add new elements, tweak it around, use a Reconstructionist Haggadah, but it remains, like the orange, a compromise between the traditional forms and the current values. At least, that's my thought! A) If you wouldn't mind deleting my second comment, and it wouldn't be much trouble, I'd appreciate that, as it looks silly right now. I obviously understand the need to moderate. B) I guess the point I was trying to make is that I'm not sure it's at all an "at least"—i.e., that societies that talk more about their aversion to child-murder actually do kill fewer children, or vica-versa, such that change in narrative is progress. In particular, when humanitarian intervention is the *ideology* supporting a half-century American imperial violence, I think "hypocrisy is the tribute vice pays to virtue" is pretty hollow. That is, I think the outward show of condemnation and regret may not check or curb our own violence (in, e.g. Sudan or Iraq), but actually justify, legitimate, and help realize it. And on the flip-side, I am not at all sure that reading the Book of Joshua, one has a right to be triumphalist about their bad narratives. It seems to me the major problem with bad narratives/celebrations would be if they led to bad practices. But I think that linkage is one that would have to be argued for, and at least prima-facie, my sense is that a lot of moderns presuppose it on the basis of Whiggish prejudice. Think about parallels to say, representations of violence in popular culture and actual rates of gun violence: the Japanese watch far more violent movies than we do, but as Americans, condemning them for it would be very silly. I'm a little fuzzy on the details, since it's been nearly six months since I read it, but I think Montaigne on cannibals has a few useful points here too. Influential on my thinking on this question has been "Forms of brutality: Towards a historical sociology of violence" by Sinisa Malesevic, which lays out the case to think that Pinker's not just pollyannish but has things exactly reversed. Probably philosophising about the right things if you get your own son to do a role reversal and become the father censuring you, as the son, about the rebellious things you said. This might be a bit close to the bone though : Really, lynching? That's something to think about in regard to religion. Then again I know a guy who gets angry when I suggest the Boss from the metal gear video games let the original Snake win the fight against her and kill her (she had a mission to complete by dying). Like I detect genuine anger - so it doesn't have to be religion. Or recognised religion, anyway, for fists to clench. It's more than about religion and stories. In the Kaddish we wail "Holy Holy Holy is the Lord of Hosts" Holiness and horribleness are glued together at the hip.